Any of the above can lead you to great campsites and most of them give reviews of the campsites that are at least as detailed as the ones I provided in the Technically Homeless blog so I'm kind of redundant nowadays. By now I guess you can see where I'm going with this post -- this is going to be my last entry, at least for a long while. 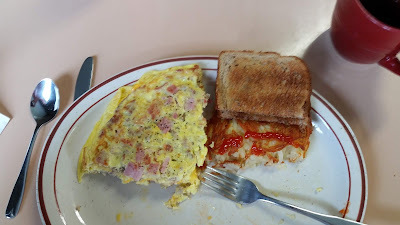 Google only charges me $10 a year to keep the blog up so I'll leave it up for at least the foreseeable future, there probably is some useful stuff in the last five years of posts that could help folks out but I won't be regularly adding posts anymore. I'll say it one more time and I really mean it! 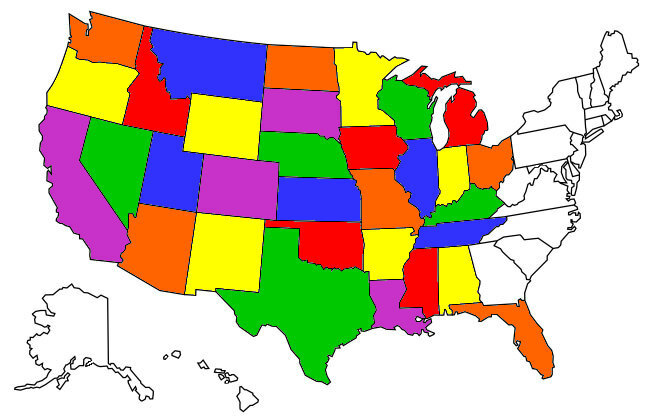 I'm relocating back to Texas for my annual November truck license sticker and to vote. 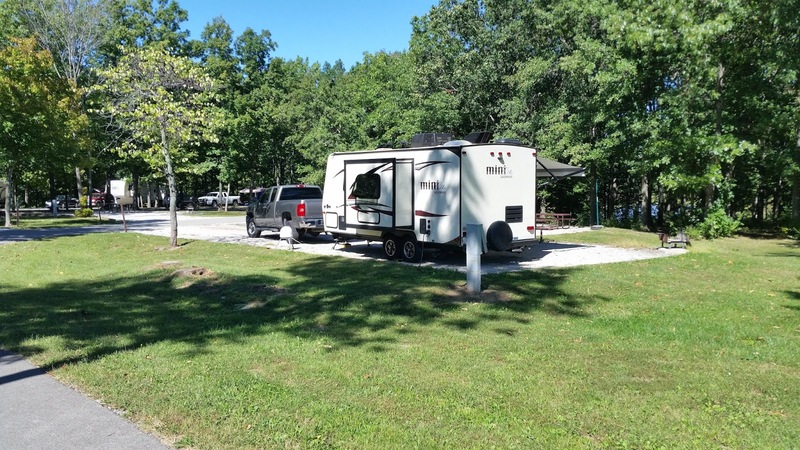 Heading south from Chicago I stopped at the Army Corps of Engineers (COE) Bo Woods Campground on Lake Shelbyville south of Sullivan, IL. 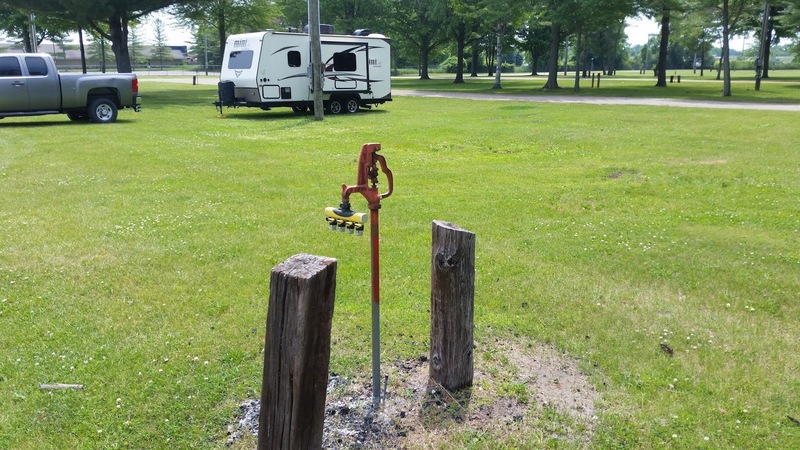 For those who've never stayed at a COE campground, they are always very well kept campgrounds with lots of amenities that are extremely reasonably priced, especially if you have a Senior Pass that cuts the posted daily cost in half. 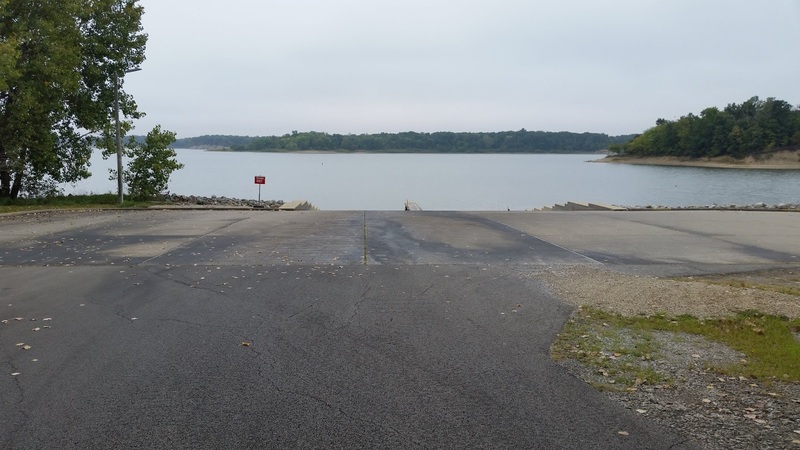 The Bo Woods boat ramp into Lake Shelbyville. Bo Woods consists of over 140 spaciously laid out campsites, all with electric hookups and also several walkin tent campsites. The campground has flush toilets, showers, a laundry and even a outdoor theatre. The shower / laundry facility. 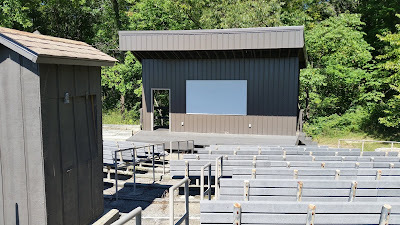 The outdoor theatre at Bo Woods. 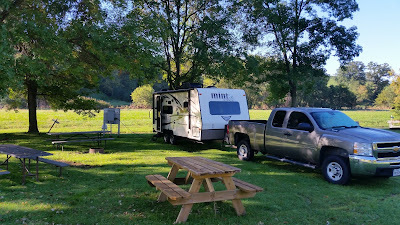 The weather was perfect as I checked in to the campground so I decided to extend my stay to a full week, for a total stay cost of $63! $9 a night for hookups is almost unheard of. It was a great seven days at Bo Woods. 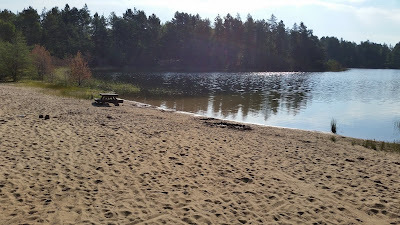 I wish I could always find COE campgrounds to stay at. Usually they are fully occupied (especially on weekends and holidays) but if you can find one along your route it's worth checking on an opening. 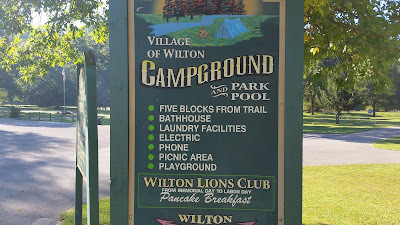 As I made my way through central Wisconsin I decided to spend a couple days at Wilton Campground in the tiny village of Wilton, WI (Pop.503). 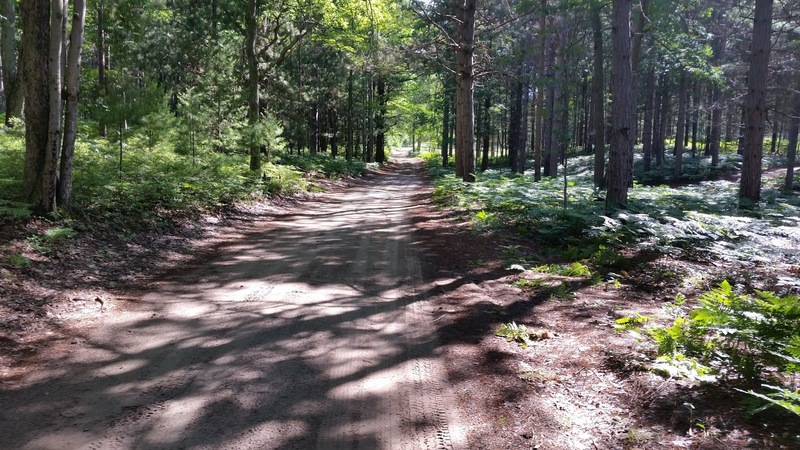 The campground is near a famous biking trail along a converted rail line. The pool, covered for the winter. The laundry thru the center door $2.50 wash $2.50 dry. 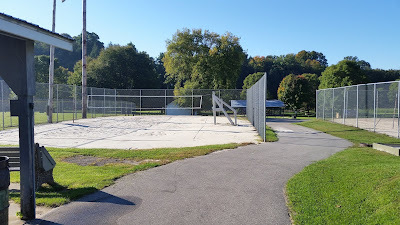 One of the 2 volley ball courts. Along with a covered pavilion, a kiddie playground and a fenced softball field. 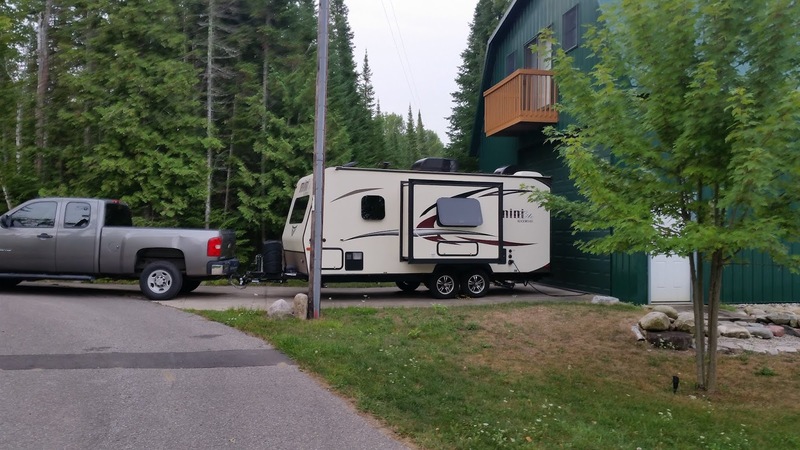 So using the above costs I camped at this great campground with electric for $10 per night, a great value! My first night there was one other camper in the park, the second night I had the park completely to myself, I regretted having to continue on south towards Chicago. 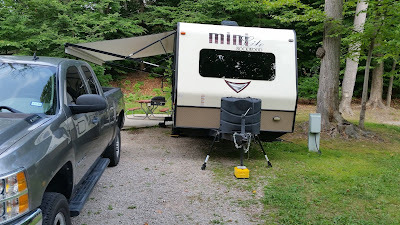 The Mini's shaded site at Wilton Campground. The park has an off-site attendant who comes by about 6 PM your first night there to collect the camping fee and offer plastic trash bags if you need them. He cleaned the laundry, bathrooms and showers promptly at 8 AM both my days there. 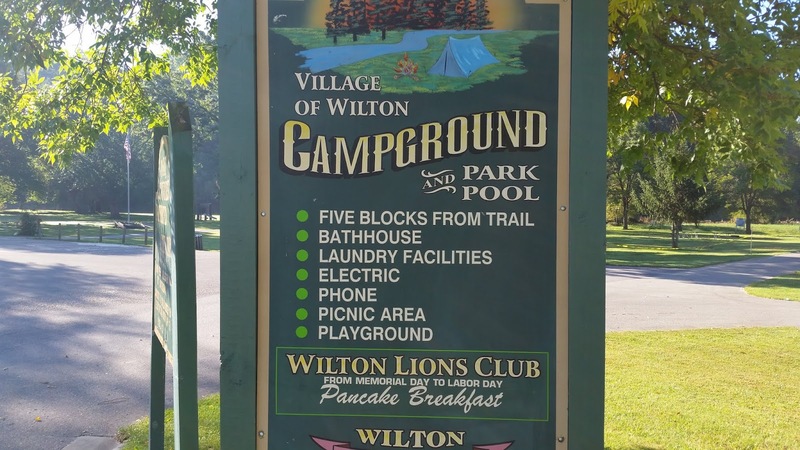 Like I mentioned I would have stayed at least a few more days at Wilton Campground if my niece's wedding outside Chicago didn't beckon. 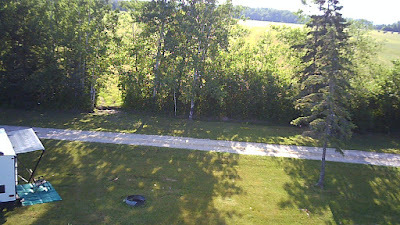 Why turn down my own "private" $10 a nite campground? It's been a great summer here in Michigan, I'm really glad I decided to spend so much time here. However the nights are starting to venture into the upper-40's here in the Upper Peninsula which is Michigan's way of telling me it's time to start south. I've got one more night here in Wakefield Park, which I reviewed here: Wakefield Park Review then I cross south into Wisconsin on the way to my niece Carly's wedding this Saturday in Illinois. I got the best site in the park, right on Sunday Lake! The wedding concludes all my midwestern commitments for this year and then I will start meandering south with the eventual goal of arriving in Livingston, TX for voting in November. No big rush to get there, obviously! 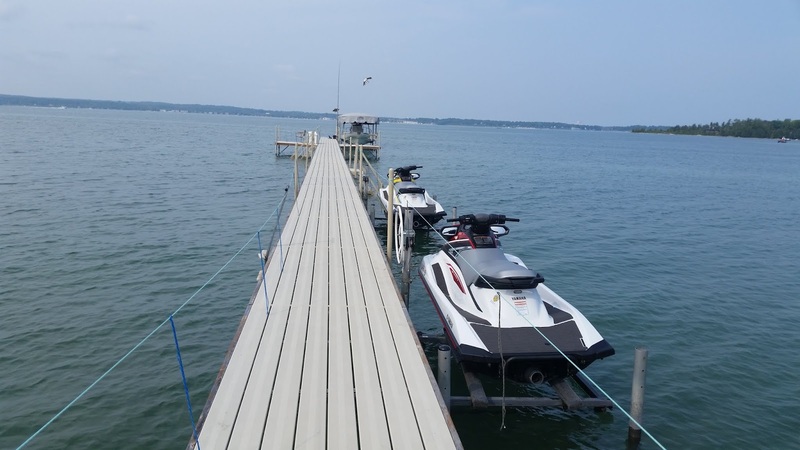 In the six summers I've been full-timing I've never spent a whole one in Michigan until this year. It's been kind of nice, Michigan has (mostly) great weather and temperatures in the summer and I hope I've documented all the great places there are to camp in the state. 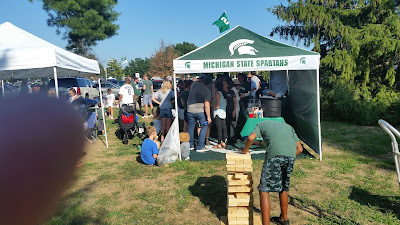 One thing I do each summer before ending my Michigan stay is attend one of my alma mater's (Michigan State) football games. This year it was the season opener versus Utah State. 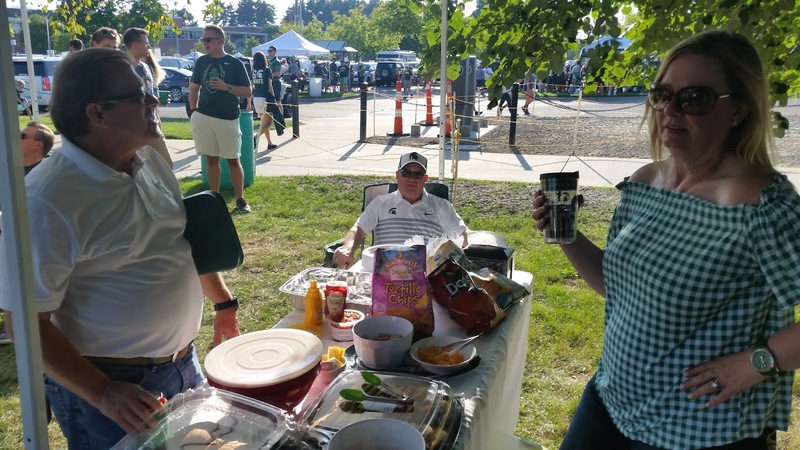 My friends Gary (left) and Steve (seated) at one of the tailgates we attended. The game was played under perfect weather conditions and ended up being a lot more exciting for Spartan fans than it was supposed to be! We went to the game hungry but the multiple tailgate parties cured that. Sometimes early in the season we get up so far ahead of our opponents many fans leave early. 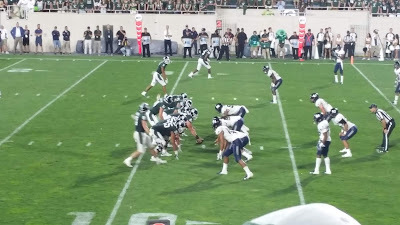 Not this year, Michigan State trailed by one point with time running out in the 4th quarter! Getting ready for the winning score, right in front of our seats! We scored to go up 38-31 but there were still two minutes left in the game and Utah State had moved the ball on us all night. Fortunately, a Michigan State linebacker intercepted a Utah State pass with a minute left and we held on to a hard fought victory! One of the most exciting MSU games I've seen in years! The term "glamping" refers to glamorous hi-end camping and readers of this blog know I've never come close to glamping, usually pretty much the polar opposite. Until last week that is. My college buddy Scott has a friend and business acquaintance who owns what is probably best described as a "compound" on Lake Charlevoix and the friend graciously offered it to Scott and friends to use for five days in the middle of August--we graciously accepted! The main house in the compound we stayed at. Not only did we get a beautiful house to base out of there were also "toys" that came with the site! Waverunners and a Boston Whaler! I only got my Waverunner up to 36 mph, Scott's wife Ann got her's up to 51! I parked the Mini in front of the compound's barn where it fit nicely. 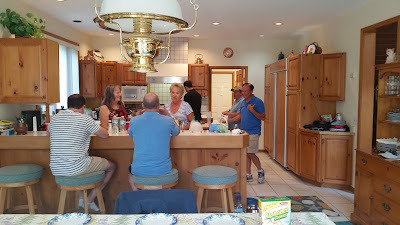 It was a real blast cooking meals together although we hit some of Charlevoix' great restaurants for wonderful whitefish dinners too. 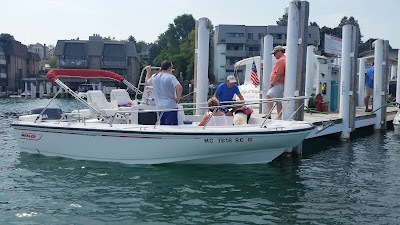 To gas up the water craft we had to go clear to the other end of Lake Charlevoix but nobody complained! Gassing up the Boston Whaler. 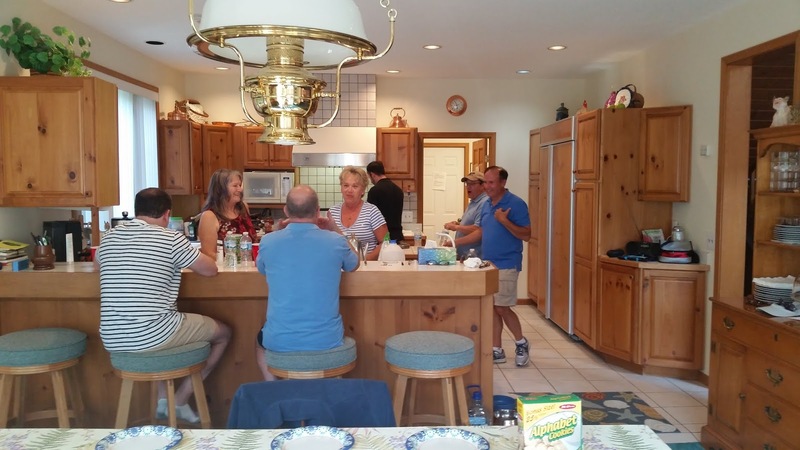 It was really generous of Scott's friend to let us use his place for five days. 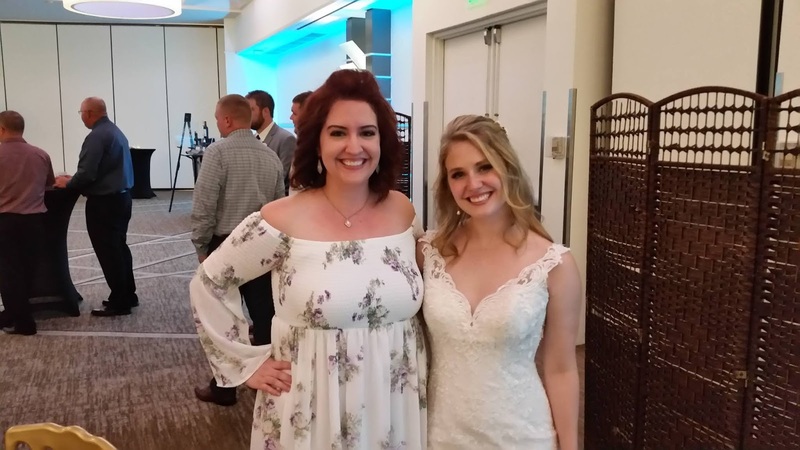 We had perfect weather and everyone had a great time. We spent the last morning cleaning the house and the water craft to get them into pristine condition like when we arrived and also left a couple of nice house gifts for the owner to show our gratitude for a great five day stay. I'd go back in a minute! 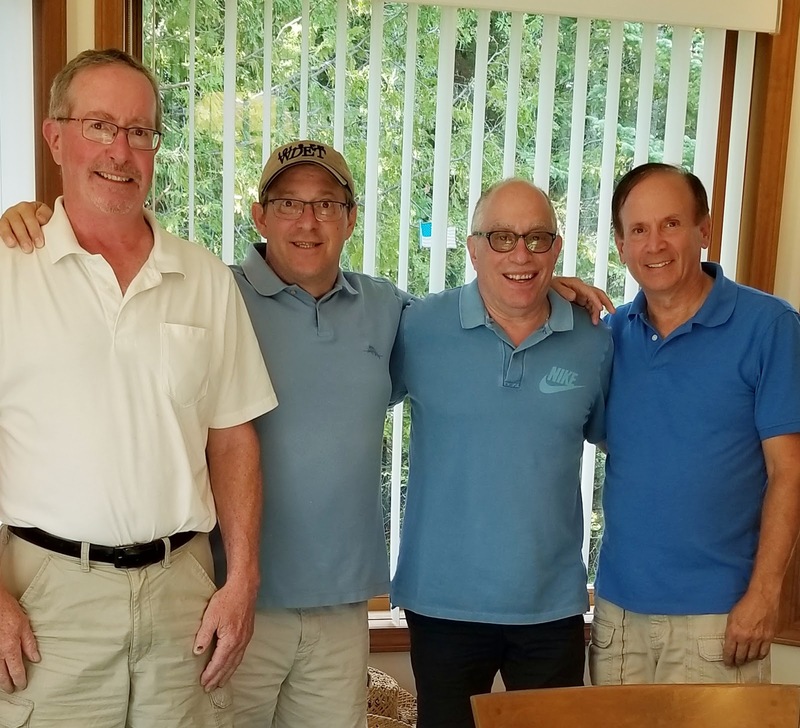 People familiar with vacationing in Michigan's lower peninsula generally recognize the Charlevoix area as one of the most desireable camping/vacationing destinations in the state. 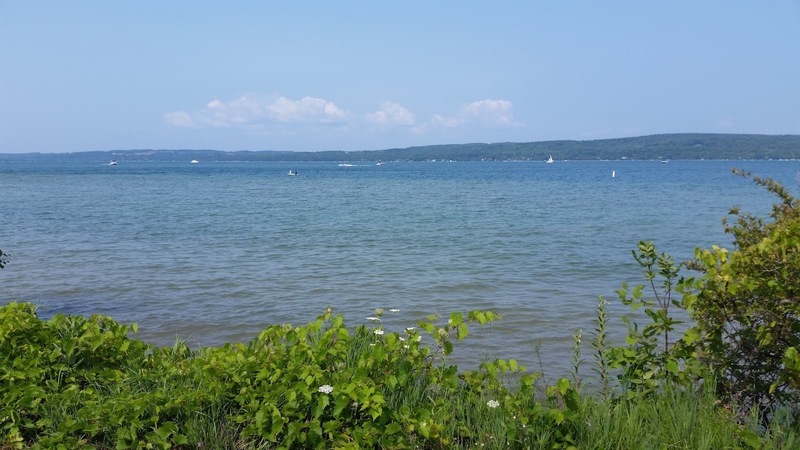 Specifically, anywhere on beautiful Lake Charlevoix. During my previous camping itineraries I had purposely avoided the Charlevoix area due to crowding and high priced campgrounds, the most desirable area equals the highest pricing, or so I thought. 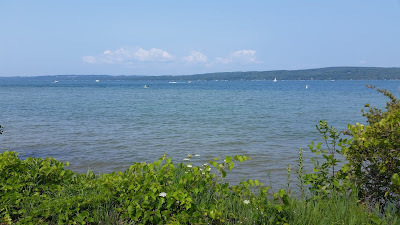 This year three college buddies and I were planning on spending five days at a lake side house and being in the area three days early I ventured to Whiting Park, a county park on the southeast side of Lake Charlevoix. The park sits on both sides of the lakefront road. 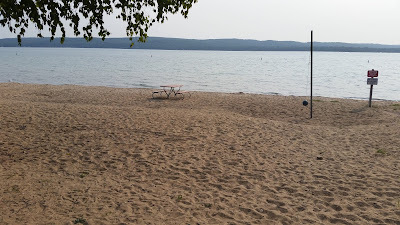 I expected to pay through the nose for the privilege of camping on Lake Charlevoix during the height of the season but was pleasantly surprised at the reasonable rate of $25 per night. 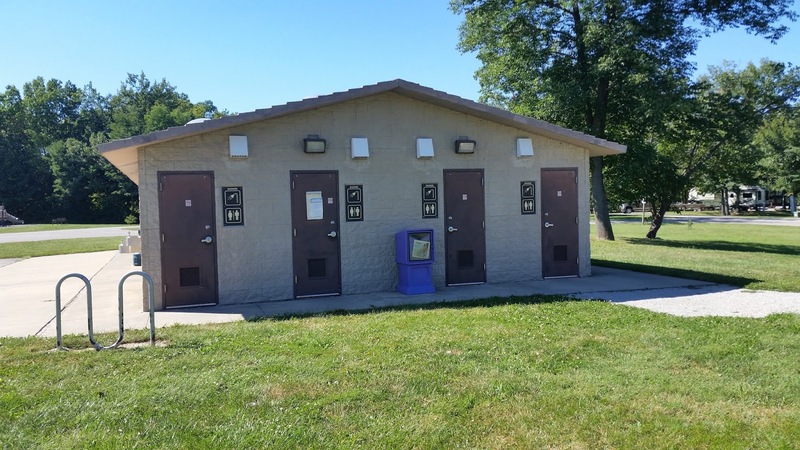 You get electric hookups at Whiting Park but no water or sewer although fresh water is available at the dump station or the bath house. 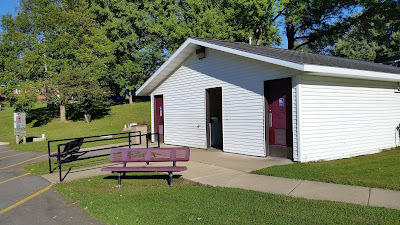 The Whiting Park bath house. The campsites themselves all have a rather pronounced slant towards Lake Charlevoix so be prepared to work on leveling your RV. I had to add blocks under the front jack to reach level due to the slope. For me, the best feature of Whiting Park was the miles of forest trails traversing it's 136 acres, I got my steps in every day on really great hiking trails. 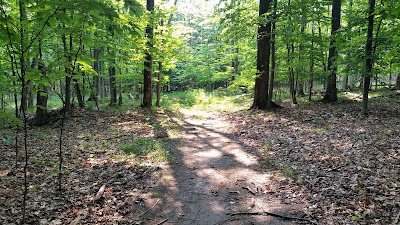 A sunlit trail in Whiting Park. 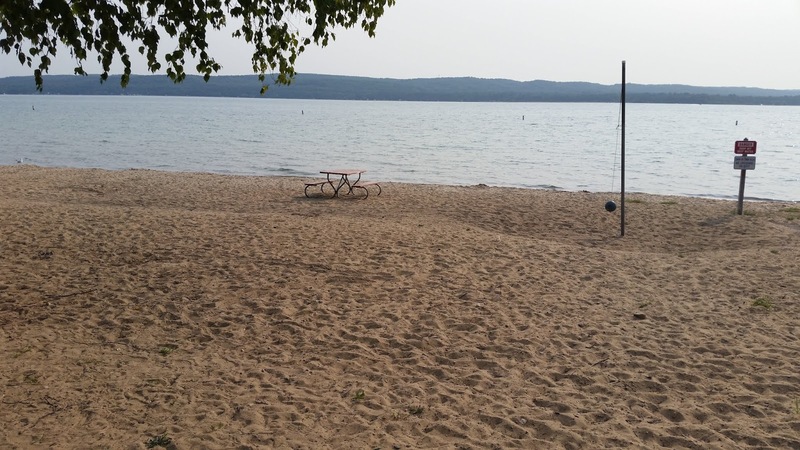 For most people though the sandy beach on Lake Charlevoix is the premiere attraction at the park. A section of the large sandy beach at Whiting Park. 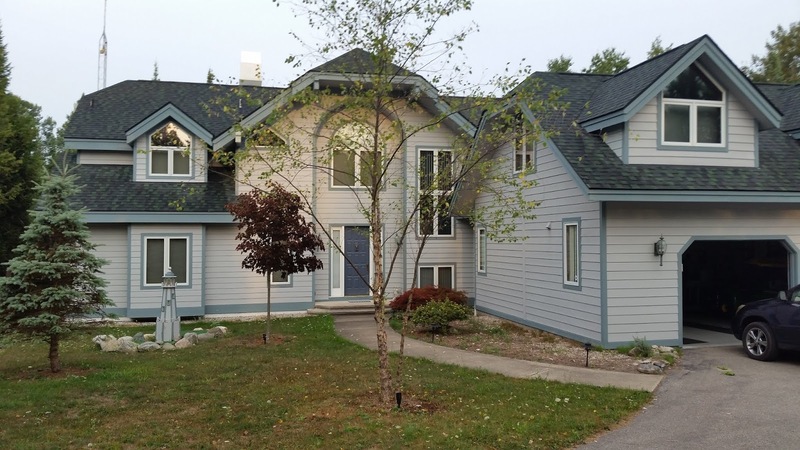 Given the high demand area Whiting Park is in $25 per night during peak season is a pretty good value! The hiking trails alone would probably get me back next year. 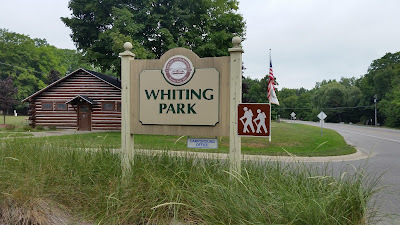 Sometimes I need to challenge my pricing assumptions about camping locations and Whiting Park was definitely one of them. 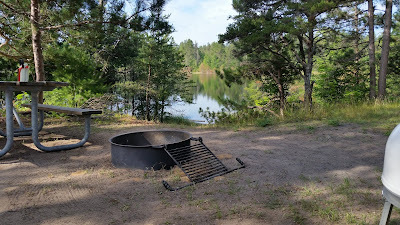 In the heart of the Hiawatha National Forest I "discovered" a small camping gem, Soldier Lake Campground. I camped there for a week in August and will definitely be adding it to my "Will Return" list. 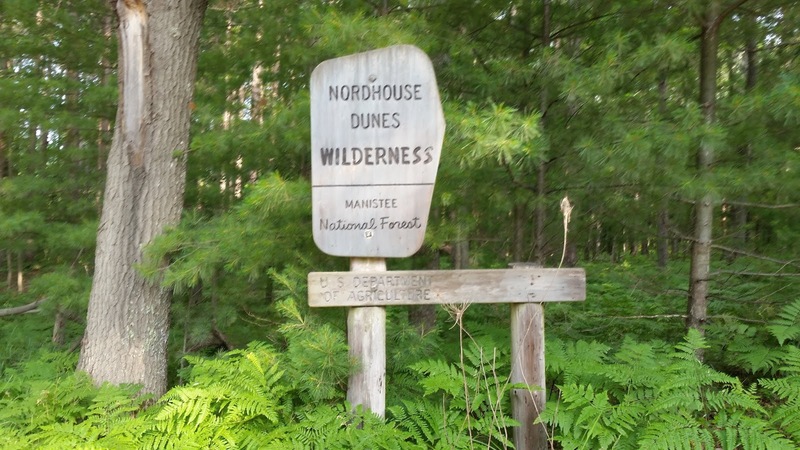 Administrated by the National Forest Service. Soldier Lake is a tiny fresh water lake about two miles south of M-28 and twenty miles east of Newberry. The campground stretches around three sides of the lake and includes a day use public beach and picnic area with a nice sandy beachfront. Soldier Lake seen from the public beach area. Coming into the campground on a Tuesday I was fortunate to get a lake front site with probably one of the best views in the whole place as a lot of the lakefront sites have their view of the lake blocked by thick stands of trees. The beautiful lake view from campsite #8. 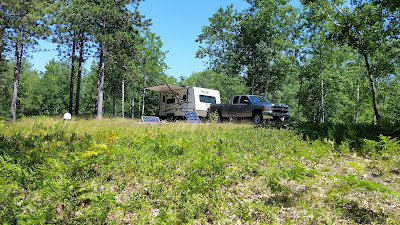 I really picked site 8 because it was relatively open to the sky vs. most of the heavily shaded sites and I knew I'd be relying heavily on my solar setup with no hookups. 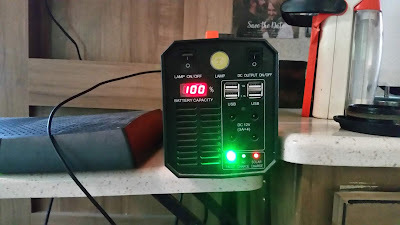 The second half of my stay turned rainy and it was a challenge to keep all my devices and the Mini's house battery charged with the dearth of direct sunlight. 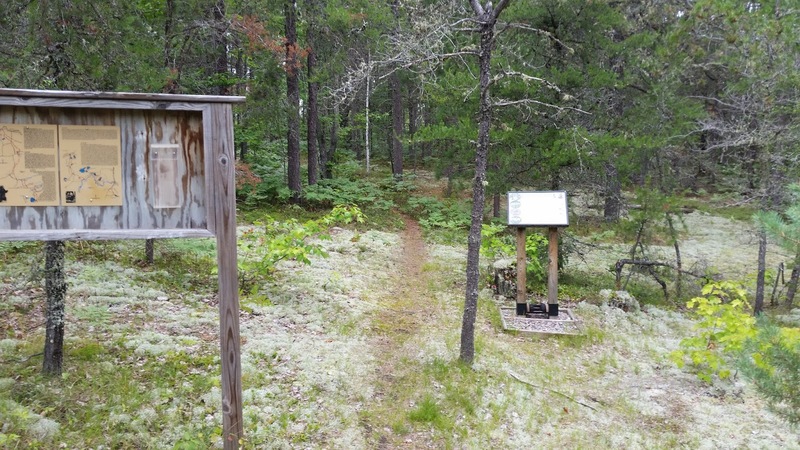 There are several marked hiking trails through the thickly treed forest surrounding the campground. A trailhead near the campground. The road through the campground is paved which was nice when it rained so hard, it was still possible to get walks in without wading through a river of mud. 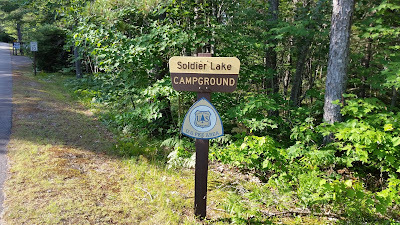 I loved the camping experience at Soldier Lake! 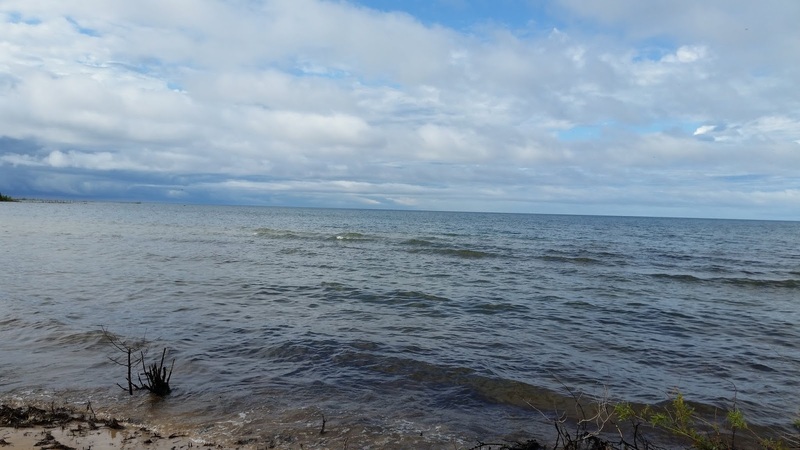 For $56 I got seven days of great lakefront camping and the rain at the end was free of charge. If you're in the Upper Peninsula near Newberry I'd strongly recommend staying at Soldier Lake Campground! 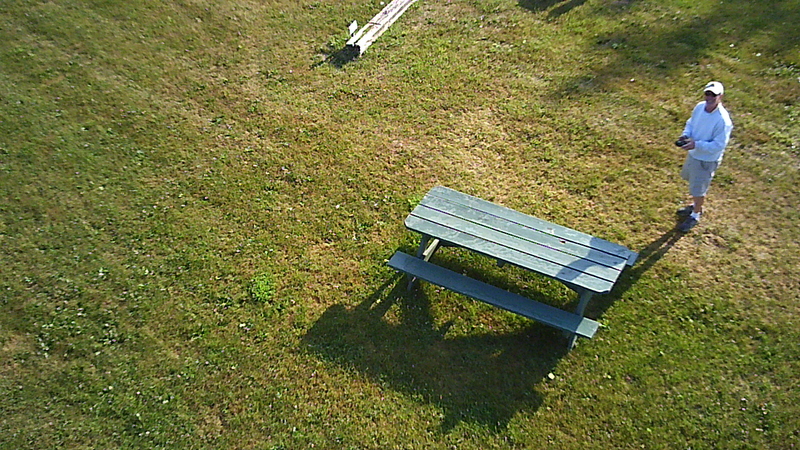 That's me by the picnic table. The Mini's campsite from 100 feet. Maybe I can find some video editing software to give a more polished look, I'll do some research into it. It works for the same reason you don't wear black on a hot sunny day. 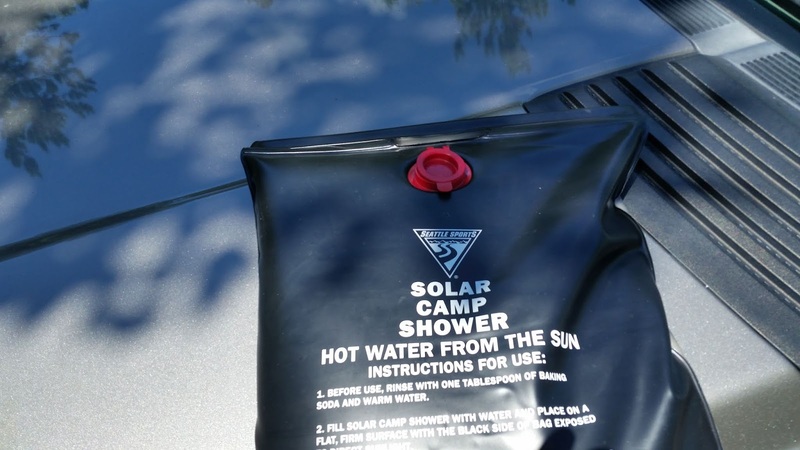 You pour about a gallon or so of water into it then set it in the sun (here it's on the hot hood of the pickup) and about 3 hours later you have water that's up to 120 degrees. I touched the bag to determine when it'd be comfortable to shower with then took it onto the Mini's shower and had a decent shower! I only used about half the water in the bag. Simple and effective, just like me! Beats driving to Ohio! I got back to my campsite in the Lake Michigan Rec area as quick as I could and, fortunately it was unoccupied so I jumped on it. Why keep coming back to the same site? Hard to beat this backyard! 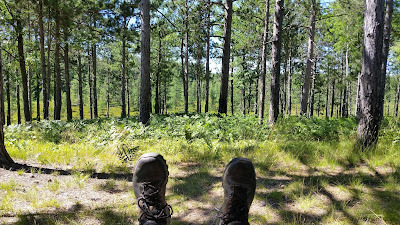 No mosquitoes (surprisingly), great hiking, almost ideal temps, almost total quiet (except for birds), usable Verizon (with a cell booster) oh, and it's free for up to 14 days! This was my second stretch at the site this summer and I'm not ruling out a third! 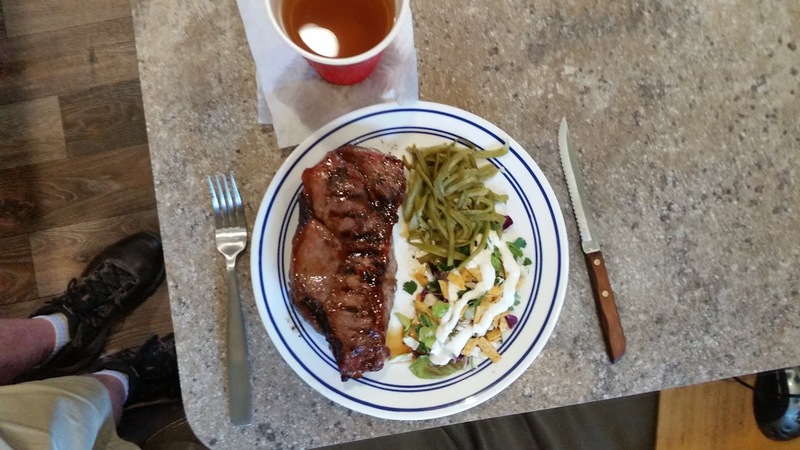 A nice big steak to celebrate the 4th in the Manistee National Forest! Got my work cut out for me. I'll need more than my usual hike along Greens Road to burn these calories! 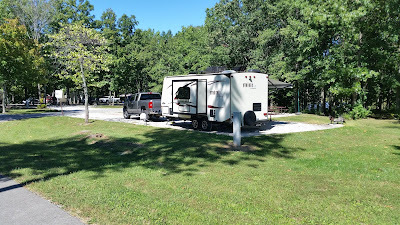 I'm back at the Lake Michigan Recreation Area for the week leading up to July 4th boondocking in some great weather, although kind of warm. 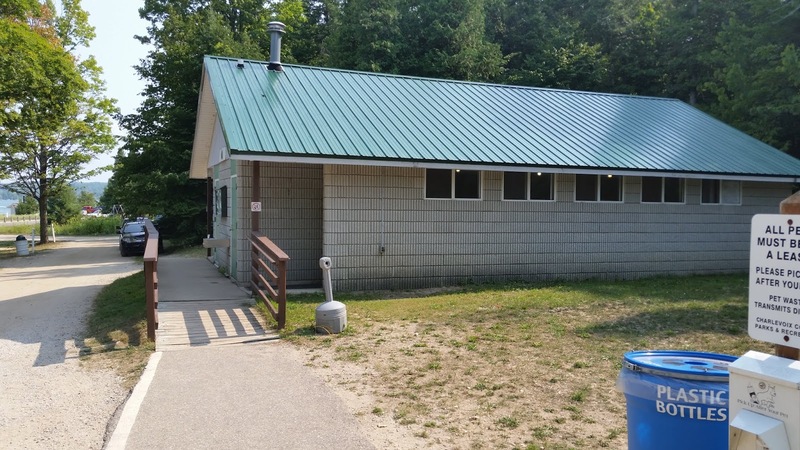 I originally reviewed the Rec Area here: Lake Michigan Rec Area Review . I got here early and snagged the last campsite that has open views of the sky with only a few blocking trees so solar and DISH TV are both working really well! 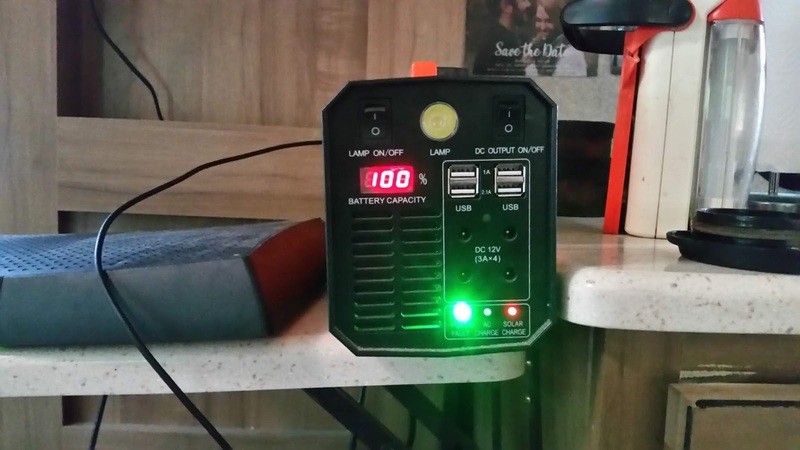 Even running the DISH and TV while charging my phone the battery stays at 100%. On a sadder note my 35 year old Ibanez electric guitar finally gave up the ghost. I loved that old guitar but over 35 years I really beat the Hell out of it. So I got a new one! 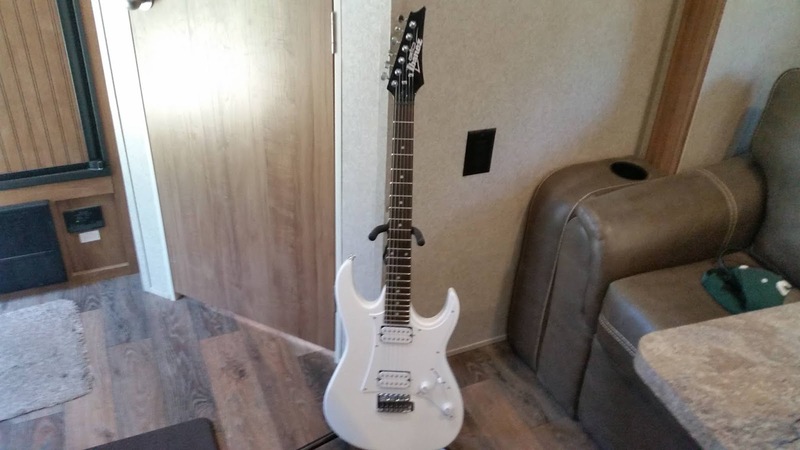 It even came with a nifty guitar stand. Thanks Amazon! This campground is one of my all-time favorites and it's pretty packed which isn't surprising given the holiday next week. My campsite is nicely isolated from the sites to either side so I can't see or hear my neighbors which is great. You can even get decent Verizon reception if you use a cell booster. 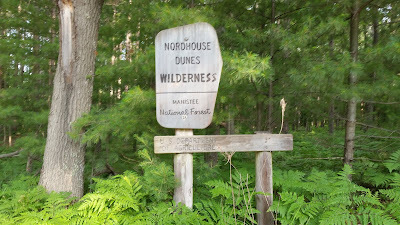 Part of the Manistee National Forest. 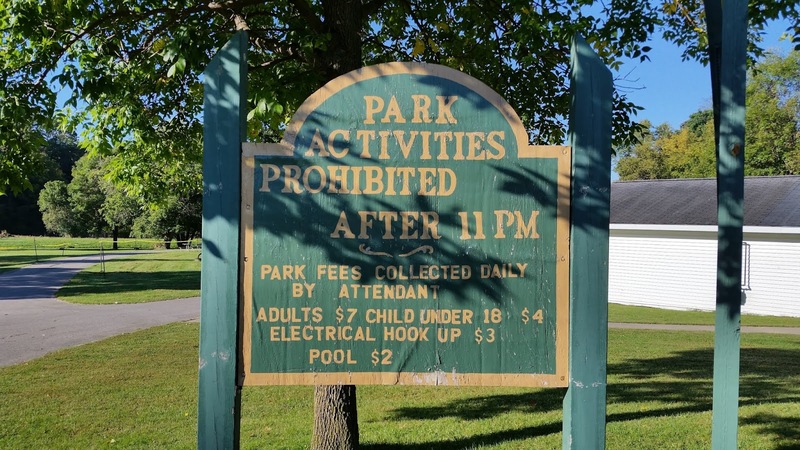 I'm spending a week at the Glen Gough Memorial Park in Pickford, MI. 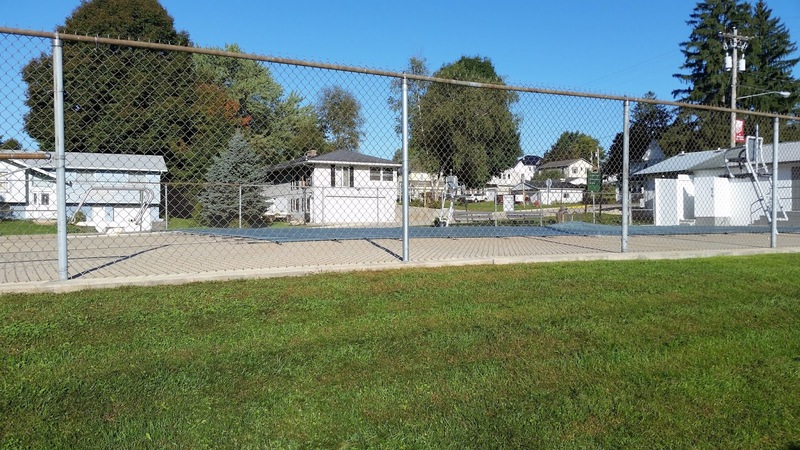 I previously reviewed the park here: Picford Township Park Review. 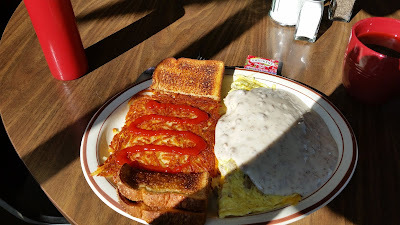 When you stay in Pickford eating at least one breakfast at Big D's Diner is MANDATORY. 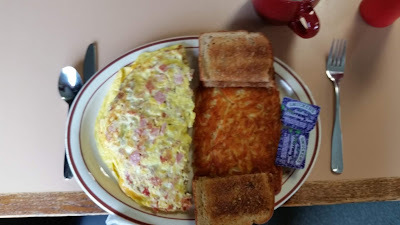 The Meatlover's Omelette! About a pound of goodness. One of the daily specials is the Meatlover's Omelette which must have at least a half pound of cheese, meat and eggs in it -- I challenge you to finish it! As far as I got. Fortunately Big D's provides "To Go" boxes because as you can see I have another meal left over. Diet, what diet? When I visit my family in Midland, MI I used to park the Mini at the Four Seasons RV Park and bite the bullet and pay their $38 per night camping fee because there really isn't a lot of RV parks in the Midland area. This year I wanted to visit my Dad for Father's Day so I did some research on non -$38 per night venues and found that the Midland County Fairgrounds charged only $20 per night so I tried the fairground camping out. 87 degrees! So much for escaping the Southwest heat. 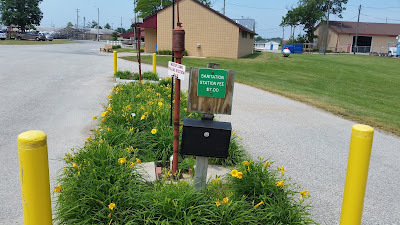 The RV sites at the Fairgrounds are informally laid out on grass pull-thru's where the electric hookups are supplied by centrally located poles where about 6 to eight receptacles are hung. 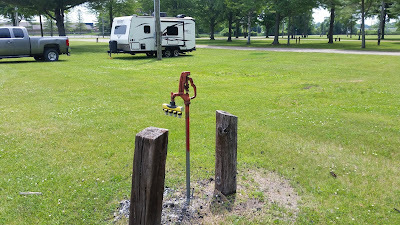 The Mini parked near a "power pole", water is available from spigots like in the foreground. There are several very well cleaned bathrooms around the Fairgrounds, one has showers for campers. 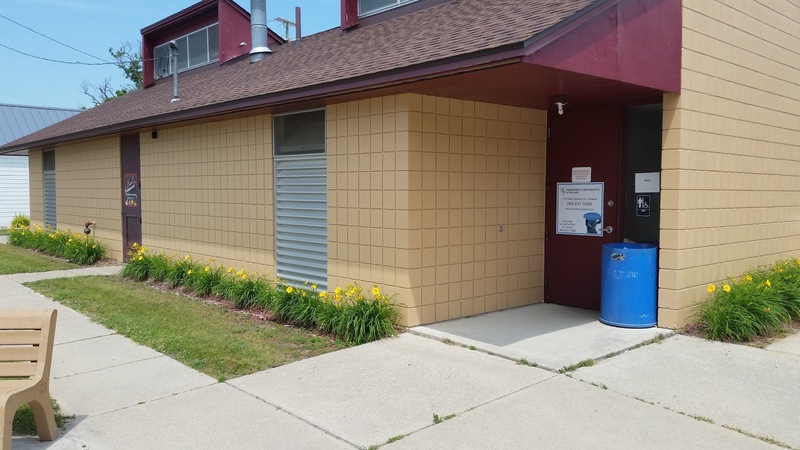 The flower-lined shower house at Midland County Fairgrounds. 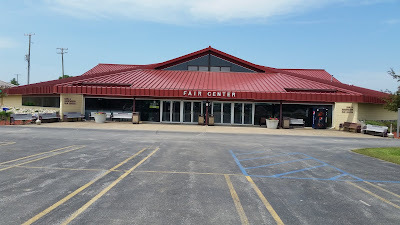 As I mentioned in the Data Sheet you could not be any closer to shopping when you stay at the Fairgrounds, the Midland Mall is right across the street along with a Walmart, Home Depot and a bunch of other stores. 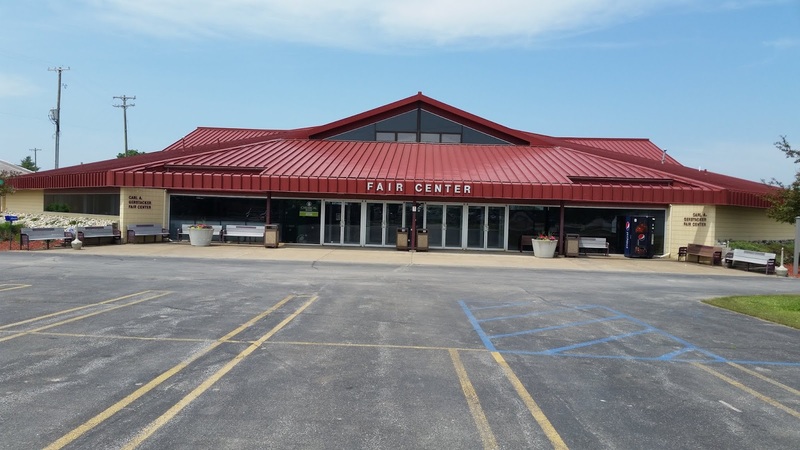 The Fairgrounds is also only about a half mile from my Dad's house so that was also convenient. The campground office is thru the glass doors then immediately left. The county really does a nice job of keeping the Fairgrounds up and litter free, it really enhanced the camping experience. 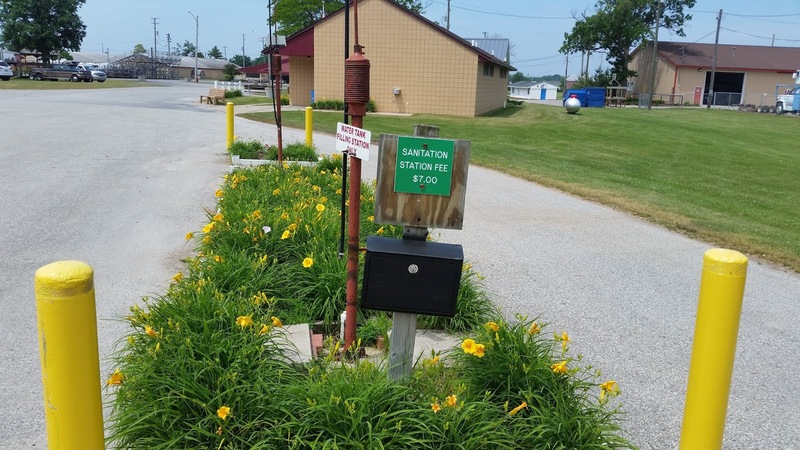 Even the Dump Station is lined with flowers! 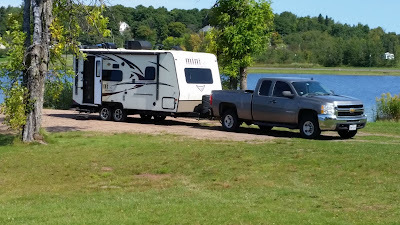 I enjoyed my 3 days camping at the Midland County Fairgrounds and I enjoyed saving $54 dollars over what I would have spent at Midland's "other" RV park even more. 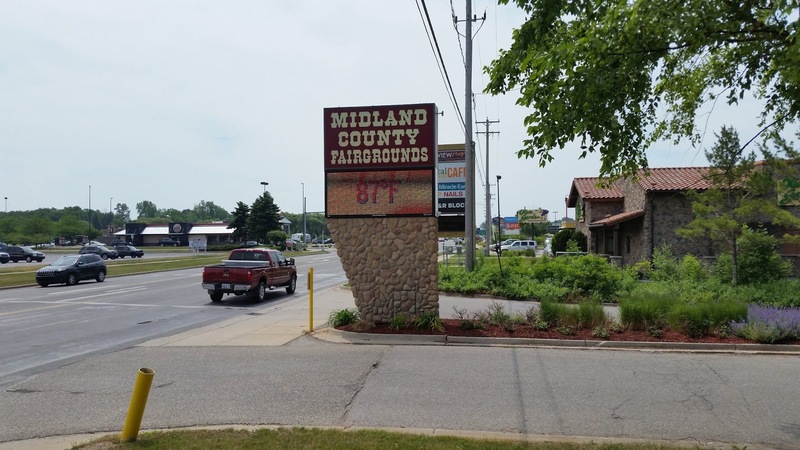 The Fairgrounds is now my default Midland campground!